If you want to write your own game review to be included on 360-HQ, you can do so at anytime by visiting our submit reviews area here. 1. Choose a game you would like to review from the dropdown list. 4. Fill out the ratings for sound, video and gameplay etc. 5. hit the submit button. We will add some screenshots and tidy up your review if we find any problems so don't worry. 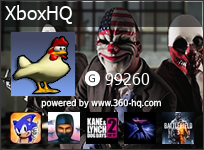 SUBMIT YOUR XBOX 360 GAME REVIEWS ON 360-HQ!